I have found a new favorite place in Portland. 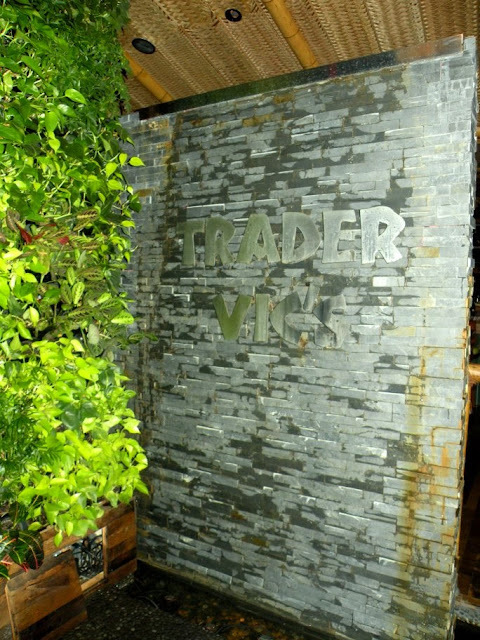 The other night, after popping into Bridgeport Brewpub with JK, JD and I stopped into Trader Vic's. Lucky for us happy hour was minutes away from starting. I used to work at 12th Ave & Marshall Street in the Pearl and drove by Trader Vic's every day on my way to and from work. 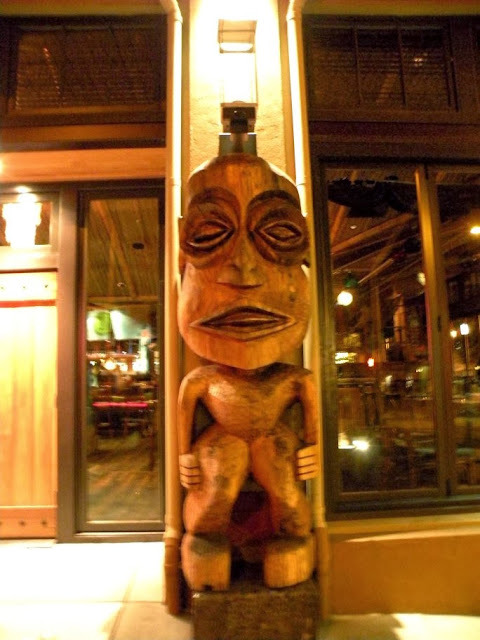 I always looked at the tikis and fire and thought about how fun it looked, yet somehow I never made it inside to take a peek. I probably had TWENTY times when friends said, "hey, where do you want to go tonight?" and it never crossed my mind to go to Trader Vic's. I guess the phrase "better late than never" applies here, although I kind of wish I had happened into Trader Vic's in the summer when they have outdoor seating and open up the sliding glass doors so the whole restaurant feels like you're outside. So when JD and I arrived, we did what any tech savvy person would do, we immediately checked in on Foursquare. 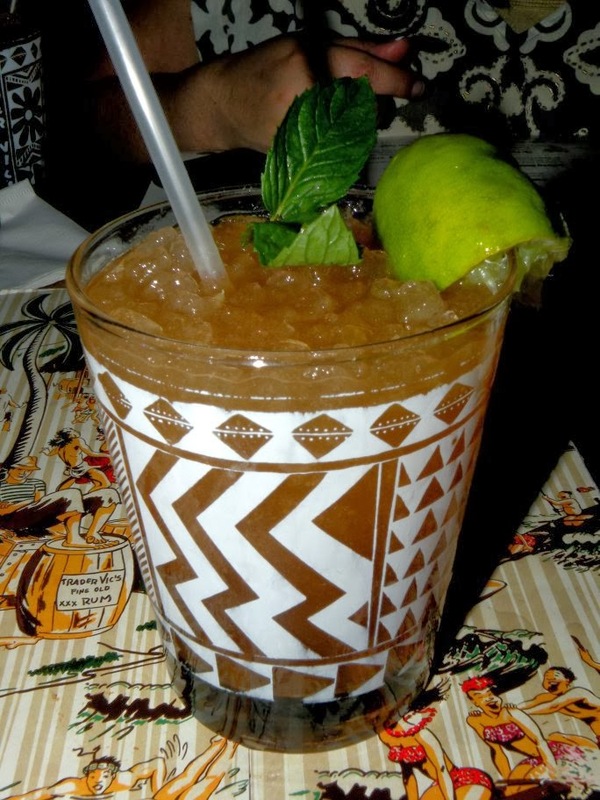 To our surprise (and delight) Trader Vic's has a Foursquare special! We both received a free 1944 (Mai Tai) for it being our first check in. I'm a novice drinker, so this was the first Mai Tai I've had. It was VERY strong for a free drink (we expected, and would have been totally fine with, a completely watered down beverage). It's apparently Trader Vic's original recipe from, you guessed it, 1944. Once we had polished off our 1944s we moved on to the Happy Hour menu and ordered up a storm. 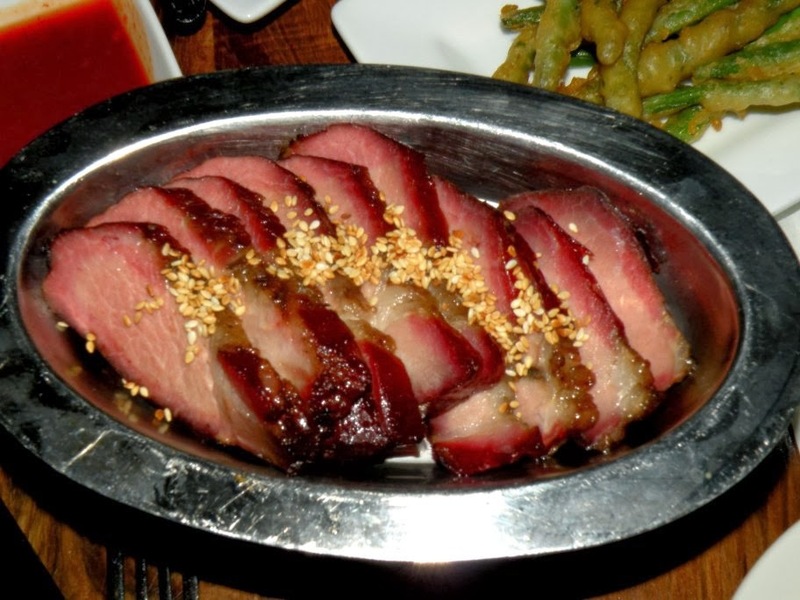 The Char Siu pork was incredible. Trader Vic's has a large Chinese wood fired oven where they roast their meats. This was a HUGE portion of meat, for the Happy Hour bargain price of $5.00. It was tender and flavorful, and was served with a great hot mustard. 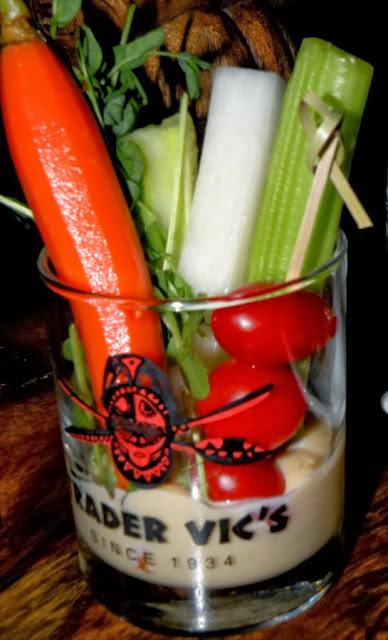 The Trader Vic's Vegetable cup was a disappointment. $5.00 for one slice of celery, one carrot, one piece of jicima, one pea pod and three cherry tomatoes seemed pretty steep. At least the veggies were fresh. Maui Waui Shrimp - JD thought these were some of the best shrimp she's had in her life. Coconut crusted with katsu slaw and a sweet and spicy glaze. 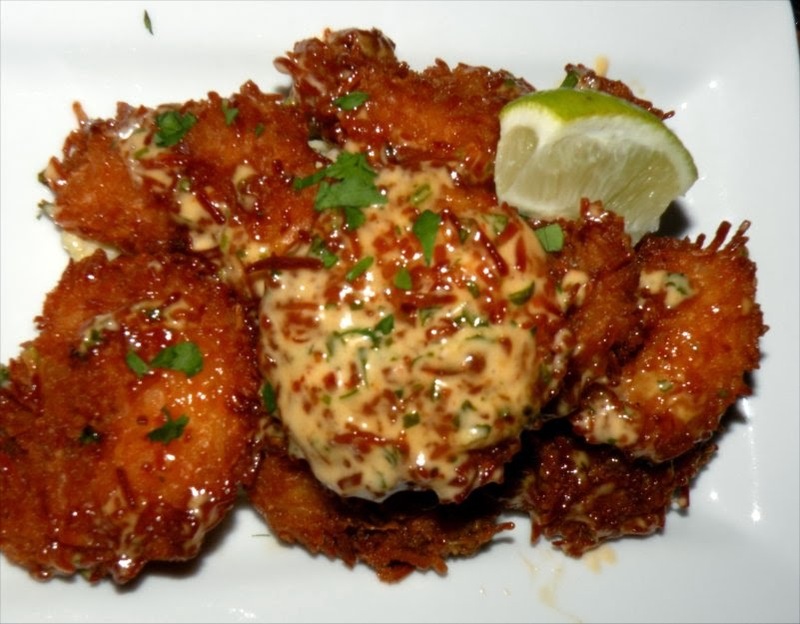 Unlike most coconut shrimp, which are mostly breading with a little coconut flavor, these were full fledged coconut dredged prawns. 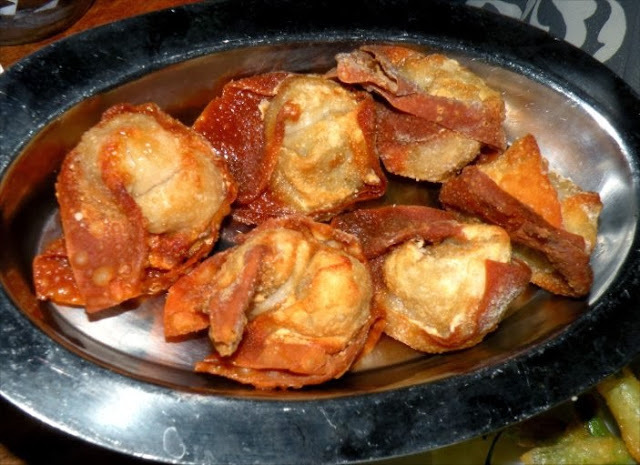 Shrimp and Pork Wontons. These looked.. well, like wontons. I didn't try them. JD said they were ok, but not exceptional. They were served with a sweet and hot dipping sauce. 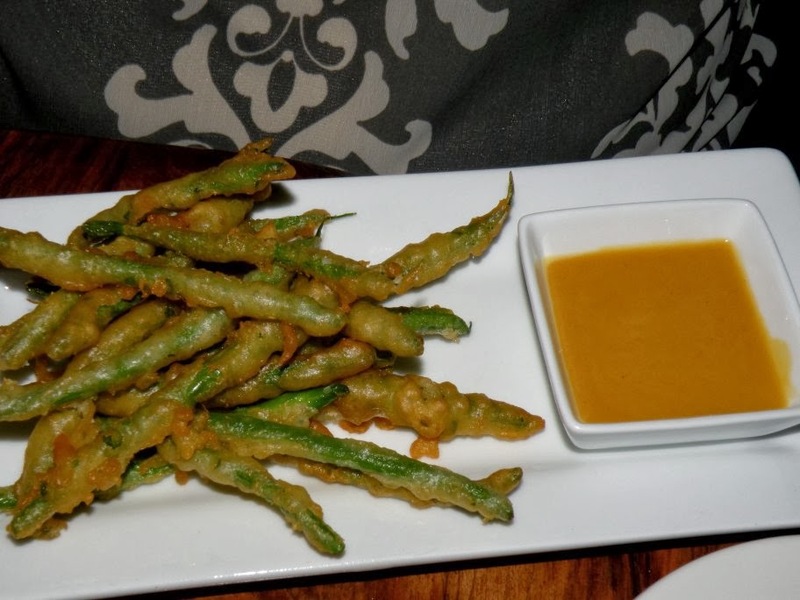 Green Bean Fries. We didn't actually order these, they showed up at our table by accident, and the server told us we could have them. They were good, and despite their shiny appearance in the photo, they didn't seem greasy at all. They were served with a hot mustard, that I didn't find to be hot at all. They were EXCELLENT when dipped in the sweet and hot dipping sauce intended for the wontons. 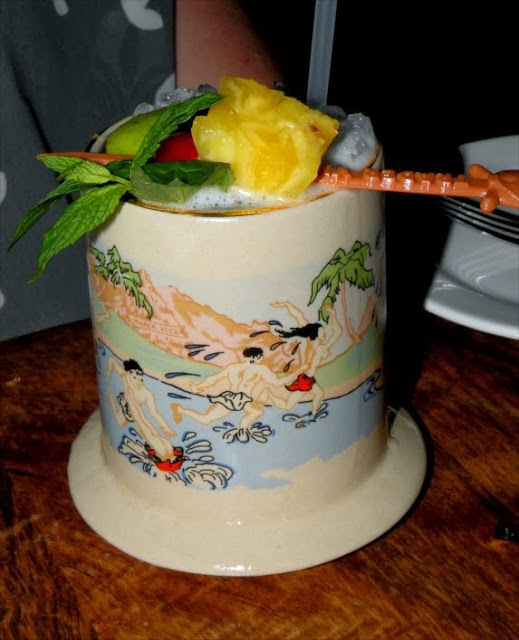 JD ordered a Honi Honi, which was probably the perfect drink on the menu for her, as the description read, "Here's a bourbon drink with a spice of the islands all wrapped into one". She really liked this drink, and hopefully I can lure her back to Trader Vic's so she can have it again. I ordered the Mai Tai Wave. 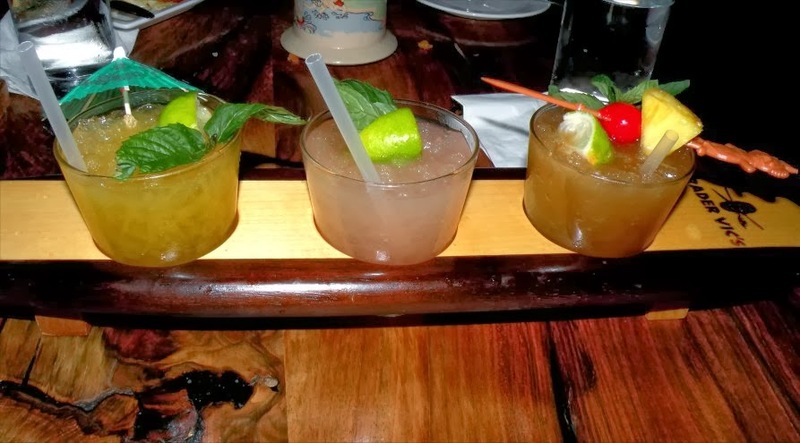 A surfboard flight of mini Mai Tais. 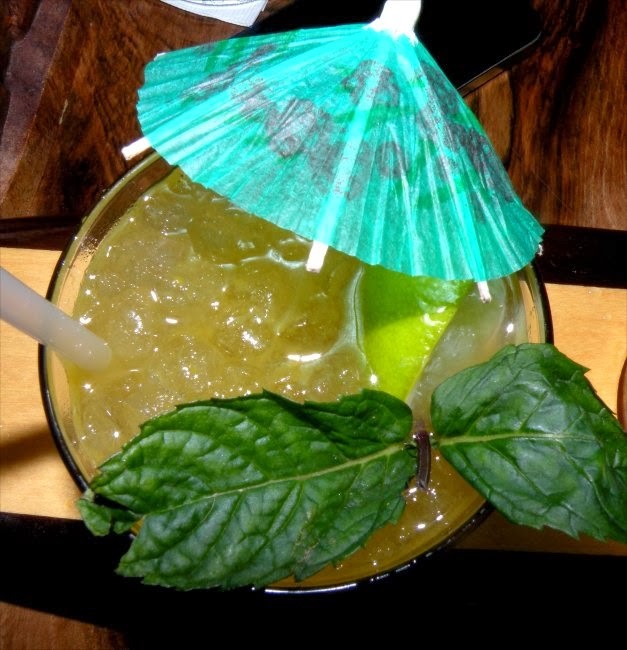 Maui Mai Tai - Pineapple juice, Trader Vic's Mai Tai mix, and rum. To be honest, by this time, they all pretty much tasted the same to me, but this one was definitely my favorite. 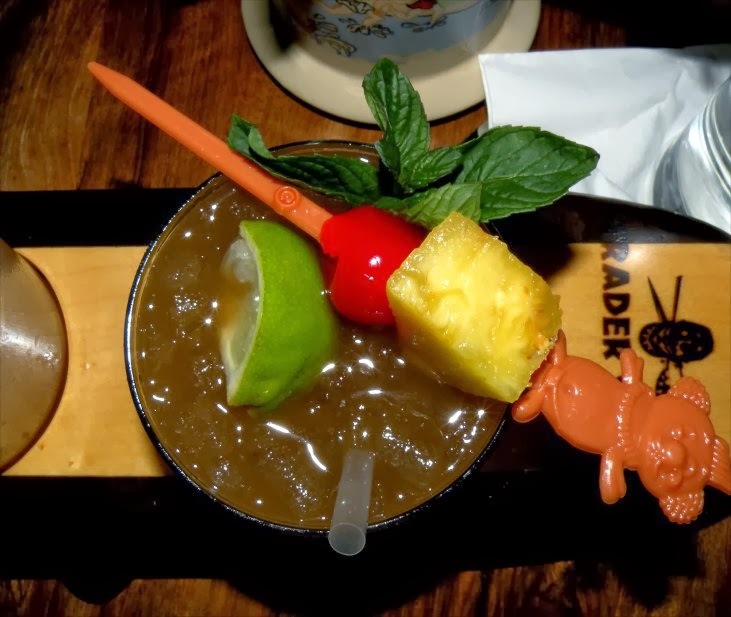 JD and I had a great debate as to what exactly is depicted on the skewer (I say it's a koala bear wearing a lei, I can't even publicly share what she thought it was, clearly she'd had more to drink than I had). When we left I realized I hadn't taken photos of all of the cool interior items, one being the waterfall. Unfortunately it had been turned off by the time I got around to taking a picture - but it's still pretty cool. I had a great time at Trader Vic's and can't wait to return. I took a peek at their regular menu, and don't see myself going for an actual meal, I prefer the offerings on the happy hour menu, and the people watching is always better late at night. If you'd like to check out Trader Vic's for yourself, their website is www.tradervicspdx.com and they're located at 1203 NW Glisan Street in Portland. They're open Sunday - Thursday from 4:00pm - 10:00pm and Friday and Saturday from 4:00pm - midnight. 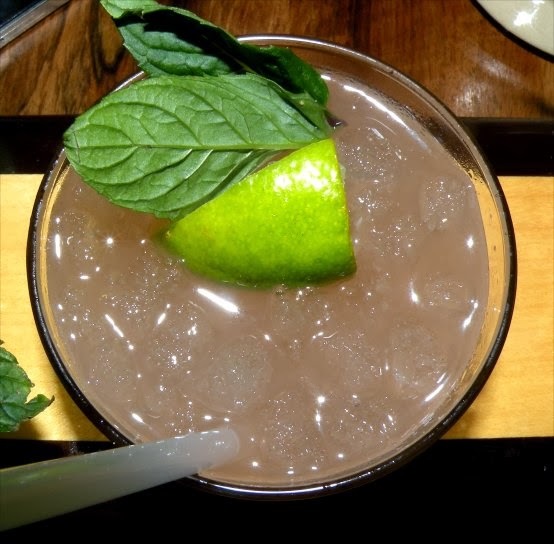 Happy Hour is daily from 4:00pm - 6:00pm and 10:00pm - close. 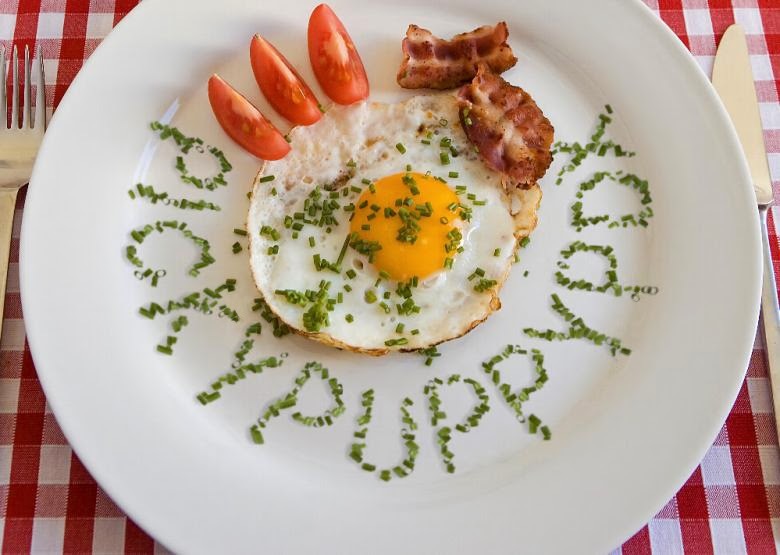 Happy 11th Birthday to the Original Pickypuppy! Have you been to Grassa? A big middle finger to corporate America?